The AMPR has participated in more than 14 major research programs and numerous instrument integrations beginning October, 1990. A summary of AMPR research missions is given below. The NASA TC4 (Tropical Composition, Cloud and Climate Coupling) mission investigated the atmospheric structure, properties and processes in the tropical Eastern Pacific. The primary area of interest was the atmosphere layer between approximately 46,000 ft and 59,000 ft (14-18 km). This is where the lower part of the atmosphere (the troposphere) meets the upper part (the stratosphere). The TC4 mission was sponsored by the NASA Headquarters Atmospheric Composition Focus Area, including the Upper Atmospheric Research Program, the Radiation Science Program, and the Tropospheric Chemistry Program. The field experiment phase was completed during July and August 2007 based out of San Jose, Costa Rica. Additional information about TC4 can be found at http://www.espo.nasa.gov/tc4/. The Tropical Cloud Systems and Processes (TCSP) mission was a field research investigation sponsored by the Science Mission Directorate of the National Aeronautics and Space Administration (NASA). The field experiment was done during the month of July, 2005 and was based out of San Jose, Costa Rica. TCSP was a successor field mission of previous Convection and Moisture Experiment (CAMEX) missions. TCSP was focused on the study of the dynamics and thermodynamics of precipitating cloud systems, including tropical cyclones using NASA-funded aircraft and surface remote sensing instrumentation. Targeted data sets were collected using the NASA ER-2 research aircraft, the NOAA P-3 Orion research aircraft, The Aerosonde Robotic Aircraft, and Atmospheric balloon soundings via latex meteorological balloons. Additional information about TCSP can be found at http://tcsp.nsstc.nasa.gov. The fourth field campaign in the CAMEX series (CAMEX-4) was based at Jacksonville Naval Air Station, Florida from 15 August through 25 September, 2001. The CAMEX-4 experiment studied tropical systems Chantal, Erin, Gabrielle and Humberto. CAMEX-4 collected data for research in tropical cyclone development, tracking, and intensification using NASA-funded aircraft along with stationary and mobile surface remote sensing instrumentation. Operations were coordinated with the National Oceanic and Atmospheric Administration (NOAA) Hurricane Research Division and the United States Weather Research Program (USWRP). The Convection And Moisture EXperiments (CAMEX) are a series of field research investigations sponsored by the Earth Science Enterprise of the National Aeronautics and Space Administration (NASA). There were a total of 10 flights that collected AMPR data, and are listed in the table below. The first two flights (on 8 and 9 Aug.) were configuration test flights prior to the actual CAMEX-4 experiment. Additional information about CAMEX-4 can be found at http://camex.msfc.nasa.gov. The Kwajalein Experiment, KWAJEX, is part of the Tropical Rainfall Measuring Mission, TRMM, whose goals include providing Ground Validation, GV, for instruments onboard the TRMM satellite launched in November of 1997. The KWAJEX field campaign is the only TRMM campaign designed to be conducted over the tropical open ocean, and was conducted between 30 July and 14 September 1999. For KWAJEX, the AMPR instrument was mounted in the NASA DC-8 aircraft. Because of this change in aircraft, the data was collected at a lower altitude. This necessitated a change in the data collection rate, as the aircraft was flying at an altitude approximately half of that flown on the ER-2. Additional information about KWAJEX can be found at http://daac.gsfc.nasa.gov/fieldexp/TRMM_FE/kwajex/. The ER-2 flew with AMPR and several other instruments over the southern Amazon Basin in order to validate the TRMM radars and imagers. This allowed direct comparison over a large land area of in situ ground based radars and rain gauge networks, to the TRMM instruments and the ER-2 instrumentation. These comparisons are necessary for the calibration of the TRMM sensors over data sparse tropical land regions. Additional information about TRMM-LBA can be found at http://daac.gsfc.nasa.gov/fieldexp/TRMM_FE/. The third field campaign in the CAMEX series (CAMEX-3) was based at Patrick Air Force Base, Florida from 6 August through 23 September, 1998. This field campaign studied four active hurricanes; Bonnie, Danielle, Earl and Georges. CAMEX-3 collected data for research in tropical cyclone development, tracking, intensification, and land falling impacts using NASA-funded aircraft and surface remote sensing instrumentation. Data collected during this study yielded high spatial and temporal information of hurricane structure, dynamics, and motion. These data, when analyzed within the context of more traditional aircraft, satellite, and ground-based radar observations, should provide additional insight to hurricane modelers and forecasters. This in turn will lead to more accurate forecasts of storm intensity, track and landfall. NOTE: The pixel latitudes and longitudes for the flights on 8/24/1998 and 9/02/1998 were approximated using GPS information only. Use appropriate caution in using this portion of the data. Flights were conducted in the Gulf of Mexico, the Caribbean and in the Western Atlantic Ocean. Additional information about CAMEX-3 can be found at http://camex.msfc.nasa.gov/camex3. FIRE, the First ISCCP (International Satellite Cloud Climatology Project) Regional Experiment, studied a variety of Arctic cloud systems under spring and summer conditions. A team of national and international scientists conducted the FIRE Arctic Cloud Experiment (ACE) in a two-phase field campaign. The first phase began in April, 1998, with a second phase conducted during July, 1998. The scientific objectives of FIRE ACE were to study impact of Arctic clouds on radiation exchange between surface, atmosphere, and space, and the influence of surface characteristics of sea ice, leads, and ice melt ponds on these clouds. FIRE ACE attempted to document, understand, and predict the Arctic cloud-radiation feedbacks, including changes in cloud fraction and vertical distribution, water vapor cloud content, cloud particle concentration and size, and cloud phase as atmospheric temperature and chemical composition change. FIRE ACE data is used to focus on improving current climate model simulations of the Arctic climate, especially with respect to clouds and their effects on the surface energy budget. In addition, FIRE ACE investigated a number of scientific questions dealing with radiation, cloud microphysics, and atmospheric chemistry. The TExas and FLorida UNderflights (TEFLUN) Experiment is a mission to obtain validation measurements for the Tropical Rainfall Measuring Mission (TRMM). TRMM is a NASA and National Space Development Agency of Japan (NASDA) coordinated mission that launched the TRMM satellite on 28 November 1997 with a unique complement of sensors to remotely observe rainfall throughout the global tropics. TEFLUN is the first in a series of experiments using a combination of airborne and surface-based measurements to complement the satellite data. Among these, are important measurements aboard the NASA high-altitude aircraft, similar to those on the TRMM satellite. They are used for direct intercomparisons with TRMM overflights where possible, but more frequently to simulate TRMM data by flying over precipitation systems within the experimental domain. These, along with surface-based measurements and computer models, will make unique contributions to our understanding of the tropical precipitation cycle. Additional information about TEFLUN-A can be found at http://daac.gsfc.nasa.gov/fieldexp/TRMM_FE/teflun/tefluna.shtml. The first Huntsville Soil Moisture Experiment was held in June and July of 1996. The AMPR was deployed on a platform suspended over plots of various and changing vegetation and moisture content. The AMPR calibration system was compromised by the operational conditions and we were unable to produce quality brightness temperatures. The raw un-calibrated data are of little or no scientific use. CAMEX-2 was conducted from August 21 through September 2, 1995. The AMPR was deployed during (CAMEX-2) which was a NASA funded scientific study conducted out of Wallops Flight Facility, VA. This experiment was designed to study the three-dimensional moisture fields using satellite, aircraft, and ground-based instrumentation and the multi-frequency radiometric and lightning signatures of tropical convection in support of the Mission to Planet Earth. The geographic domain of the CAMEX-2 region was between 25.5 degrees north to 43 degrees north latitude and 70 degrees west to 83 degrees west longitude. The AMPR was deployed for the CAMEX-1 which was a NASA funded scientific study conducted out of Wallops Flight Facility, VA. This experiment was designed to study the three-dimensional moisture fields using satellite, aircraft, and ground-based instrumentation and the multi-frequency radiometric and lightning signatures of tropical convection in support of the Mission to Planet Earth. The CAMEX-1 mission took place from September 8 through October 7, 1993. The geographic domain of the CAMEX-1 region was between 25.5 degrees north to 43 degrees north latitude and 70 degrees west to 83 degrees west longitude. The Tropical Ocean Global Atmosphere-Coupled Ocean Atmosphere Response Experiment (TOGA COARE) ran from 1 Jan 1993 through 28 Feb 1993. The interaction of the atmosphere and ocean are important in the overall energy balance of the planet, and understanding the physical processes. 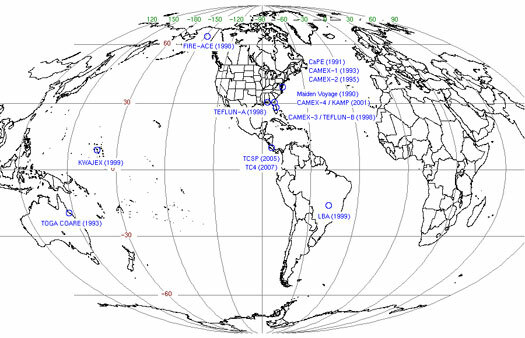 Collectively, the goals of TOGA COARE were designed to provide an understanding of the role of the warm pool regions of the tropics in the mean and transient state of the tropical ocean-atmosphere system. The scientific goals of TOGA COARE are to describe and understand: 1) The principal processes responsible for the coupling of the ocean and the atmosphere in the western Pacific warm pool system; 2) The principal atmospheric processes that organize convection in the warm pool region; 3) The oceanic response to combined buoyancy and wind stress forcing in the western Pacific warm pool region; and 4) The multiple scale interactions that extend the oceanic and atmospheric influence of the western Pacific warm pool system to other regions and vice versa. Flight information is provided in the table below. The objectives column is included for the convenience of the user; the mission objective was convection when it was forecast in the target area and radiation when it was not. Additional information about TOGA COARE can be found at http://daac.gsfc.nasa.gov/fieldexp/TOGA/. STORMFEST flights were conducted over the central US in February and March of 1992. Data were collected on many flights above numerous winter storm systems. Systems observed included thunderstorms, gravity waves and large scale precipitation regions. Additionally, data from low level features in and near the boundary layer were collected. Unfortunately, AMPR experienced problems that left the data unusable. The CaPE experiment was conducted over east central Florida near Cape Canaveral in 1991. NASA provided aircraft and remote sensing instrumentation to observe convection, microphysical and electrical parameters. Ground based in situ measurements of moisture, temperature, winds, and electric fields were used as ground truth for the remote sensing instrumentation. Ground truth data is available from CLASS (Cross-chain Loran Atmospheric Sounding System) rawinsondes launched during the experiment, and conventional surface observations are available from numerous Portable Automated Mesonet (PAM) sites located within the experiment domain. In addition to wind observations from the PAM stations, wind measurements are also available from the Kennedy Space Center (KSC) wind tower network. Prior to 1993, the AMPR utilized calibration loads made of Eccosorb UHP-2-NRC. While highly emissive over the entire frequency range of AMPR, the material was a poor thermal conductor. As a result, significant temperature gradients existed throughout the warm load because the heat produced by the heater strips did not efficiently conduct through the material to the other side, which the radiometers viewed. Thus, uncertainties in the temperature of the load translate directly into errors in the calibrated Tb. Complicating the estimation of the surface temperature of the warm load is the corrugated shape of its surface, causing significant temperature gradients even at a constant depth in the material. Even though seven thermistors were embedded at several locations and depths within the load, an accurate solution to the problem would have required many more thermistors, knowledge of the different channels beam patterns across the load, and knowledge of the depths within the load to which different frequencies were sensitive. In contrast, the cold load was continually cooled with a stream of ambient air forced over the front and the back of the load, resulting in a uniform load temperature throughout most of a flight. A simple, but empirical, solution to the hot load problem was used. Cloud-free land (warm Tb) and ocean background (cold Tb) measurements were taken throughout one of the October 1987 Florida flights. Radiative transfer model calculations of the most probable Tb in these situations were regressed against the thermistor and radiometer digital count data to arrive at regression coefficients that could then be applied to the thermistor temperatures. These calibration coefficients were found to provide consistent results during all subsequent flights. As a result, pre-1993 AMPR Tb will generally agree with model calculations for land surfaces or cloud-free ocean backgrounds since the calibration is dependent upon these model calculations. The absolute accuracy of the pre-1993 AMPR data is difficult to estimate, but is probably within about 4C, except at 85.5GHz Tb below 200K for which the absolute error probably exceeds 5C, and below 150K the error might reach 10C. After installation of the new loads, a radiometer system warm bias problem of approximately 10C was discovered and remedied early in the TOGA COARE deployment. Even though this problem existed during the pre-1993 operation of AMPR, it was removed empirically by the procedure described above (Spencer et al., 1994).